Please join us on Saturday, May 19 at 10:30 a.m. for our Pack 570 Transition Ceremony. Party and picnic to follow after ceremony. Who: All Scouts and family members (Do you know someone interested in Scouts? Invite them along!) Scouts, please be in Class A uniforms. When: Saturday, May 19 at 10:30 a.m.
Burgers, brats and hot dogs will be provided. 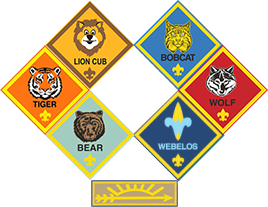 SCOUTS, please bring something from the assigned list below to share! RSVP below so that we have an appropriate count for food. There is no cost!